To establish a method for determining ursolic acid content in Patrinia scabiosifolia Fisch. ex Trevir. ; and to investigate the inhibitory effect of Patrinia scabiosifolia Fisch. ex Trevir. extract on in vitro cultured human cervical carcinoma Hela cells. HPLC with Agilent XBP-C18 column (4.6 mm × 250 mm, 5 μm) was used. Mobile phase was acetonitrile-methanol-0.5% ammonium acetate solution (68:10:22), while detection wavelength was 210 nm. Human cervical carcinoma Hela cells were cultured in vitro and treated with 0.125-2.0 mg/ml of Patrinia scabiosifolia Fisch. ex Trevir. extracts for 24-72 h. Then, cell proliferation was assayed by MTT assay, apoptosis was detected by FCM, and morphology was observed by TEM. Methodological results showed that regression equation was Y=4.7659x+17.933, R2=0.9998. 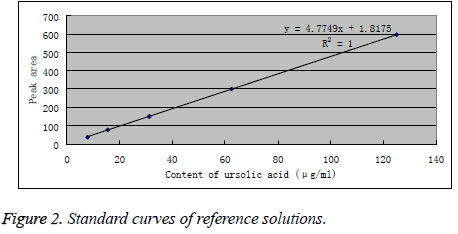 Ursolic acid presented a good linearity within a 5.21-130.25 μg/ml concentration range. Average recovery was 99.9%, RSD=2.06%. Patrinia scabiosifolia Fisch. ex Trevir. inhibited Hela cells in a dose- and time-dependent manner, with 24 h IC50 being 1.231 mg/ml. FCM revealed increased apoptosis of cells after treatment with Patrinia scabiosifolia Fisch. ex Trevir., while TEM observation found early apoptotic changes in partial cells. With advantages such as simplicity, fastness and good reproducibility, the method proposed can be used for quantitative determination of ursolic acid in Patrinia scabiosifolia Fisch. ex Trevir. Patrinia scabiosifolia Fisch. ex Trevir. has a pronounced inhibitory effect on Hela cells, and induction of apoptosis may be one of its mechanisms. Patrinia scabiosifolia Fisch. ex Trevir,. Ursolic acid, HPLC, Content determination, Cervical carcinoma, Apoptosis. Patrinia scabiosifolia Fisch. ex Trevir. is a perennial herb, whose whole plant is used as medicine. Originally recorded in the Shen Nong's Herbal Classic, the herb is pungent and bitter, which has heat-clearing, detoxifying, stasis-removing and pusexpelling functions and is widely used in clinical practice, with prominent efficacy for chronic appendicitis. In some parts of China, Patrinia scabiosifolia Fisch. ex Trevir. seedlings and tender leaves are used for edible purposes [1,2]. Patrinia scabiosifolia Fisch. ex Trevir. contains triterpenoids, volatile oils, saponins, etc. [3-5]. Modern medical research has shown that Patrinia scabiosifolia Fisch. ex Trevir. has antitumor, antiallergic dermatitis, antioxidant and immunoenhancing effects [6-9]. According to recent studies, Patrinia scabiosifolia Fisch. ex Trevir. appears in Chinese compound prescriptions and can be used for treating pelvic inflammatory disease, cervical erosion, cervicitis, cervical cancer, etc. [10-12], without side effects of chemotherapy drugs. Thus, the anti-cervical cancer effect of Patrinia scabiosifolia Fisch. ex Trevir. has gained increasing attention. However, there are scarce reports on the cervical cancer inhibiting effect of Patrinia scabiosifolia Fisch. ex Trevir. at present. This study preliminarily investigated the inhibitory effect of Patrinia scabiosifolia Fisch. ex Trevir. extract on in vitro cultured human cervical carcinoma Hela cells. To control the quality of crude drug and extracts, we used reversed-phase HPLC to determine the ursolic acid content in Patrinia scabiosifolia Fisch. ex Trevir. and its extracts, in order to provide reference for the industrial drug production. Patrinia scabiosifolia Fisch. ex Trevir. was collected from the West Tianmu Mountain in Zhejiang, which was identified by Professor Zhang Min of the Department of Pharmacy, Nanjing Pharmaceutical University as the whole plant of Patrinia scabiosifolia Fisch. ex Trevir. in the genus Patrinia of the family Valerianaceae. Fresh Patrinia scabiosifolia Fisch. ex Trevir. was dried in the shade, ground into a fine powder and sifted for later use. Ursolic acid standard (batch No. : 332749-2015098) was provided by the National Institutes for Food and Drug Control. Chromatographically pure acetonitrile and methanol; chemically pure ethanol, methanol and other reagents (purchased from Tianjin Nansuo Chemical Reagents Co., Ltd.). Cervical carcinoma Hela cells were gifted by the Research Center of the Second Affiliated Hospital of Nanjing Medical University. Agilent 1200 LC system; Mettler-Toledo MS104TS analytical balance; Kunshan Shumei KQ5200E ultrasonic unit (Shanghai Chongfeng Scientific Instruments Co., Ltd.); 0.45 μm aqueous and organic phase microporous membrane (Nanjing Senfei Laboratory Supplies Co., Ltd.). FBS, DMEM medium (Gibco); MTT and DMSO (Sigma, USA). Octadecyl silane-bonded silica column Agilent XBP-C18 (4.6 mm × 250 mm, 5 μm) was used for chromatography. Mobile phase was acetonitrile-methanol-0.5% ammonium acetate solution (68:10:22), detection wavelength was 210 nm, flow rate was 1.0 ml/min, column temperature was 35°C, and injection volume was 20 μl. 10 mg of ursolic acid was accurately weighed, added with 75% methanol and shaken uniformly to give a 0.25 mg/ml reference stock solution. Appropriate amounts of the stock solution were accurately weighed and diluted serially with 75% methanol to give reference solutions with concentrations of 7.81, 15.63, 31.25, 62.50 and 125.00 μg/ml, respectively. Each 20 μl of the reference solutions was injected for HPLC analysis. Peak areas were recorded, and standard curves were plotted with concentration as the abscissa and peak area as the ordinate. 1 g of sample powder was accurately weighed, placed in a 10 ml stoppered Erlenmeyer flask, added with 10 ml of 75% methanol and ultrasonically extracted for 30 min, then let cool at room temperature, diluted to a constant volume with 75% methanol, shaken uniformly and filtered. The subsequent filtrate was then filtered through a 0.45 μm microporous membrane to give the sample solution. Cervical carcinoma Hela cells were routinely thawed and passaged in a 37°C, 5% CO2 incubator with 10% FBScontaining DMEM medium. Patrinia scabiosifolia Fisch. ex Trevir. crude drug was pulverized, soaked overnight in a 6-fold volume of 80% aqueous ethanol, then extracted for 2 h three times. After filtration, solvent was removed under reduced pressure to give the 80% aqueous ethanol extract, which was then dried into a powder (0.5 kg). The extract powder was fully dissolved in water, injected onto the D101 macroporous resin column and eluted sequentially with water and 30%, 60%, 90% aqueous ethanol. The 60% aqueous ethanol eluted fraction was gradient eluted with aqueous ethanol (30%, 60%, 90%) by column chromatography on MCI to give the 60% ethanol fraction, which was then rotary evaporated and lyophilized to obtain the Patrinia scabiosifolia Fisch. ex Trevir. extract powder. Logarithmic phase Hela cells were plated in 96-well culture dishes at 1×104 cells/well. 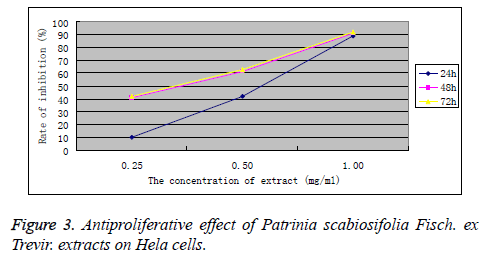 After adherence, different concentrations (1.00 mg/ml, 0.50 mg/ml, 0.25 mg/ml) of Patrinia scabiosifolia Fisch. ex Trevir. extracts were added, where five replicate wells were set up for each concentration. Cells without drug addition served as control. Meanwhile, a blank control group was set up for zero adjustment. After culturing for 24, 48 and 72 h, respectively, cells were added with 20 μl of 5 mg/ml MTT and incubated at 37°C for 4 h. Then, supernatant was discarded, each well was added with 200 μl of DMSO and shaken to fully dissolve crystals,followed by measurement of A values at 570 nm. Cell growth inhibition rate = (1-mean A value of treatment group/mean A value of control group) × 100%. The experiment was repeated three times, and the values were averaged. Hela cells were seeded in 6-well plates at 1 × 105 cells/ml. 24 h later, culture medium was replaced with 1.0, 0.5 and 0.25 mg/ml Patrinia scabiosifolia Fisch. ex Trevir. extractcontaining ones, respectively, while in the control group, the medium was replaced with drug-free medium. After treating for 48 h, cells in each group were digested and collected with 0.05% trypsin-EDTA, washed twice with PBS and centrifuged at 500 rpm for 5 min. After discarding the supernatant, cells were double stained with PI and Annexin V as per Annexin VFITC kit (Bender MedSystem, Austria) instructions, followed by determination of the percentage of apoptotic cells in each sample with BECTON DICKINSON FACSCalibur flow cytometer. The experiment was repeated three times, and the values were averaged. Hela cells were treated with 0.5 mg/ml Patrinia scabiosifolia Fisch. ex Trevir. extract for 48 h, then scraped with a cell scraper, centrifuged, fixed in 2.5% glutaraldehyde and prepared routinely into TEM specimens, followed by ultrastructure observation under a HITACHI electron microscope. As shown in Figure 1, under identical chromatographic conditions, the sample and reference had the same peak appearance time (t=15.6 min), where the peak was the ursolic acid peak. Under these chromatographic conditions, the peak of ursolic acid in sample had large separation from adjacent peaks, suggesting that the conditions were suitable for determination of ursolic acid in the sample. Figure 1: HPLC chromatograms of ursolic acid in the reference (a) and sample (b). Standard curves were plotted with concentration of ursolic acid as the abscissa and peak area as the ordinate. Regression equation was obtained as Y=4.76595X + 17.933 (R2=0.9998), indicating good linearity of ursolic acid within a 7.81-125.00 μg/ml concentration range (Figure 2). Figure 2: Standard curves of reference solutions. Each 20 μl of sample solution was injected at 0, 1, 2, 4, 8, 12 and 24 h, respectively for measurement of peak areas and calculation of RSD values. The results showed that the peak areas of ursolic acid at 0, 1, 2, 4 and 8 h were 1894.41, 1843.70, 1851.99, 1819.65, 1879.83, 1824.81 and 1846.75, respectively, with a RSD of 1.47%, indicating stability of ursolic acid in the sample within 24 h.
Each 20 μL of reference solution (ursolic acid 0.25 mg/ml) was injected repeatedly five times to measure the peak areas of reference, which were found to be 2198.18, 2220.31, 2169.04, 2179.97 and 2282.51, respectively, with a RSD of 2.03%, indicating good precision of the instrument. Six aliquots of Patrinia scabiosifolia Fisch. ex Trevir. sample with known ursolic acid content were accurately weighed, added separately with 0.7 mg of ursolic acid, extracted as per the method in the "Preparation of sample solution" and quantitatively determined. Average recovery of ursolic acid was 95.01%, with a RSD=1.92%. The results are shown in Table 1. Patrinia scabiosifolia Fisch. ex Trevir. extract was obtained as per the method in the "Preparation of Patrinia scabiosifolia Fisch. ex Trevir. extract". Five aliquots of 1 g of the extract were accurately weighed, placed in 10 ml stoppered Erlenmeyer flasks, added separately with 10 ml of 75% methanol, ultrasonically extracted for 30 min and let cool at room temperature. After dilution to a constant volume with 75% methanol, each 1 ml was accurately weighed, placed in 100 ml stoppered Erlenmeyer flasks, diluted to the mark with methanol, shaken uniformly and filtered. The subsequent filtrates were then filtered through a 0.45 μm microporous membrane to serve as the test solutions. Each 20 μl of test solutions were injected into the HPLC system for measurement of peak areas, and ursolic acid contents in test samples were calculated by external standard method. The results are shown in Table 2. Table 2. Sample content determination. 0.25-1.00 mg/ml Patrinia scabiosifolia Fisch. ex Trevir. extracts all markedly inhibited the Hela cells, and the effects strengthened gradually with increasing extract concentration and prolonging incubation time. Patrinia scabiosifolia Fisch. ex Trevir. extracts inhibited the growth of cervical carcinoma Hela cells in a time- and dose-dependent manner (Figure 3). Figure 3: Antiproliferative effect of Patrinia scabiosifolia Fisch. ex Trevir. extracts on Hela cells. After wtreating with 0.25, 0.50 and 1.00 mg/ml Patrinia scabiosifolia Fisch. ex Trevir. extracts for 48 h, apoptosis of Hela cells increased with increasing drug concentration, which were 5.66%, 8.25%, 16.64% and 41.02%, respectively. The results are shown in Figure 4. Figure 4: Effect of Patrinia scabiosifolia Fisch. ex Trevir. extracts on apoptosis of Hela cells. Under an inverted microscope, untreated cells were well adherent and morphologically normal. In comparison, cells treated with Patrinia scabiosifolia Fisch. ex Trevir. extracts presented decreased nuclear-cytoplasmic (N/C) ratio with increasing drug dose, appearance of vacuoles of varying sizes within the cytoplasm, reduced cell viability and non-adherence of partial cells. Under TEM, untreated cells possessed the general characteristics of cancer cells, presenting large invaginated nuclei with much euchromatin and little heterochromatin, high N/C ratio, and a number of irregularly shaped large nucleoli with uneven electron density and frequent margination. No degenerated organelles were observed intracellularly, cytoplasmic matrices were uniform in density, and cell surface microvilli were elongated and dense. In comparison, cells treated with 0.50 mg/ml Patrinia scabiosifolia Fisch. ex Trevir. extract for 48 h presented significantly shrunk nuclei; lowered N/C ratio; reduced, condensed or even disappeared nucleoli; markedly increased intranuclear heterochromatin with increased aggregation along the nuclear membrane margin; and thickened, partially blurred or disappeared nuclear membranes. Cytoplasm was filled with vacuoles of varying sizes, some of which were wrapped by membranes and were dilated smooth endoplasmic reticula, while others were not wrapped by membranes and were fat vacuoles or local vacuolar degeneration of mitochondria. Partial mitochondria were densely stained, with deposition of electron-dense granules. Focal lysis of cytoplasm was observed, and autophagosomes appeared, which contained phagocytosed degenerated organelles. Cell surface microvilli became thicker and shorter, decreased in number or even disappeared. Cell membranes were substantially intact. MTT assay showed that Patrinia scabiosifolia Fisch. ex Trevir. extract could significantly inhibit the proliferation of cervical carcinoma Hela cells in vitro, and the effect increased with prolonging treatment time and increasing drug concentration, suggesting Hela cell inhibition by Patrinia scabiosifolia Fisch. ex Trevir. extract in a time- and dose-dependent manner. FCM revealed that 1.00 mg/ml and higher concentrations of Patrinia scabiosifolia Fisch. ex Trevir. extracts could increase the apoptosis of Hela cells, which became more significant with increasing drug concentration. Morphological observation also found early apoptotic changes in cell ultrastructure, which suggested that apoptosis may be one of the mechanisms to inhibit human cervical carcinoma Hela cells. Since Patrinia scabiosifolia Fisch. ex Trevir. extract could inhibit the proliferation of human cervical carcinoma Hela cells, it provided broader ideas for clinical treatment of cervical cancer. Activity analyses have already found that Patrinia scabiosifolia Fisch. ex Trevir. had WBC elevating and immunoenhancing effects, which demonstrated a wider clinical application value of the Patrinia scabiosifolia Fisch. ex Trevir. extract. Further research on Patrinia scabiosifolia Fisch. ex Trevir. 's inhibitory effect on Hela cells can provide more theoretical bases for cervical cancer treatment with the herb. Through HPLC methodology investigation, regression equation is obtained as y=4.7659X + 17.933 (R2=0.9998), indicating good linearity of ursolic acid within a 5.21-130.25 μg/ml concentration range. Besides, the sample is stable, and instrument precision and sample recoveries all meet the relevant requirements, which suggest that the method is sensitive, reliable and accurate. Patrinia scabiosifolia Fisch. ex Trevir. extracts are obtained by extraction and purification. Active analyses find that Patrinia scabiosifolia Fisch. ex Trevir. has a pronounced inhibitory effect on human cervical carcinoma Hela cells, and induction of apoptosis may be one of its mechanisms. This is the first report of the effect of Patrinia scabiosifolia Fisch. ex Trevir. on Hela cells inhibitory and HPLC was used to determine the content of the ursolic acid in Patrinia scabiosifolia Fisch. ex Trevir. The research has played a role in controlling the quality of extracts to lay the foundation for future industrial production or clinical application. Yang DH, Wei LX, Cai SQ, Wang X. Chemical constituents in roots and rhizomes of PatriniascabiosifoliaFisch. ex Trevir. China J Chinese MateriaMedica 2000; 25: 39-41. Feng J, Wang LL, Zhang TJ. Simultaneous HPLC determination of oleanolic acid and ursolic acid in Haleniaelliptica. Chinese J ExpTrad Med Formulae 2011; 17: 79-81. Gao L, Zhang L, Wang LM, Liu JY, Cai PL, Yang SL. New triterpenoidsaponins from Patriniascabiosifolia. J Asian Nat Product Res 2012; 14: 333-341. Kang WY, Wang JM, Tian PY. Analysis of volatiles in the flowers of Patriniascabiosifolia BY HS-SPME-GC-MS. Chem Nat Compound 2011; 47: 101-102. Sidorovich TN. Study of the tincture of Patriniascabiosifolia. Farmatsiia 1967; 16: 35-36. Yang XL, Li QW, Li J. Anti-cervical cancer activity of total flavonoids in Patriniascabiosifolia. Heilongjiang Animal Sci Vet Med 2009; 10: 106-107. Wang ZY, Kong XL. Clinical efficacies of anti-tumor crude drugs. Prog Japanese Med 1985; 4: 188-192. Chen JL, Wang CZ, Li PY, Han HX. Research progress of chemical constituents and pharmacological effects of PatriniaJuss. Special Wild Eco Animal Plant Res 2014; 3: 59-62. Xiao MZ, Zhu SN, Zhang AH. Research advances in medicinal and edible utilization of plants of Patrinia. J JinlingInstTechnol 2007; 3: 83-86. Yuan CB, Li Q, Zhang LY, Zhao HJ, Wang SF, Bi XJ. Efficacy observation of YiyiBaijiang Decoction combined with fulvic acid in the treatment of HPV-positive cervical erosion. Mod J IntegratTrad Chinese Western Med 2015; 14: 1543-1544. Luo CR, Li XH. Clinical observation of Baijiang Capsule for the treatment of cervical erosion. Mod J IntegTrad Chinese Western Med 2006; 4: 463-464. Wang LL. Study on the anti-cerivical cancer effect of saponins from Patriniavillosa in mice. Int J Trad Chinese Med 2011; 12: 1083-1085.